Learn how to cross-develop on your computer for the Raspberry Pi’s ARM processor. Learn how to use a breadboard with LEDs and buttons. Learn how to download and run bare metal programs on the Raspberry Pi. When you arrive at lab, find a partner and introduce yourself to one another. Together you will tackle the exercises outlined below. Everyone is encouraged to collaborate with other labmates to share insights and offer each other useful tips. The instructor and TA will circulate the room to offer advice and answers so as to keep everyone progressing smoothly. Lab is a time to experiment and explore. We introduce topics in readings/lectures, and the guided exercises in lab follow up to further your understanding, put your knowledge to work, give you practice with the tools in a supported environment, and prepare you to succeed at this week’s assignment. Bare metal programming requires precision. A trivial error or slight misunderstanding can totally block your progress; the resolution may be simple yet almost impossible to see yourself. Our goal in the lab is to get you past these sticking points. Use our support to keep your momentum up and avoid the frustration from fighting with problems that appear insurmountable! Each lab has a set of check-in questions that you can use to self-test your understanding. Try to answer these questions as you go and please talk with us to resolve any confusion. The check-in questions are intentionally simple and your responses are not graded; we use them as a gauge of how you’re doing with the material so that we know better how to help guide you. To get the most out of lab, you should not aim to do the minimum required of you in the shortest possible time. If you already have a good handle on the material, use the lab period to dive into further nooks and crannies or help out those peers who could benefit from your experience. You should also get to know the instructors. They are masters of the craft, and you will learn a lot by talking to them and asking them questions. Any topic is fair game. The combination of hands-on experimentation, give and take with your peers, and the expert guidance of our staff is what makes lab time truly special. Your sincere participation can really accelerate your learning! If you are using a Windows laptop, install a virtual machine running Linux following our VM install instructions. This virtual machine will have the arm cross-development tools already installed. If you are using a Mac laptop, follow our Mac install instructions to install the arm cross-development tools and console drivers. You do not have to install a virtual machine, since OS X is already based on UNIX. Review our guide to the Unix command line. If this doesn’t work, don’t worry. We can help you resolve issues in lab. When start lab, pull up the check-in questions in your browser so you can refer to them as you go. All CS107e labs are distributed as git repositories. To get the lab materials, you clone the lab repo. You will have an individual repo for each lab. You’ll repeat the above steps at the start of each lab to update your courseware repo and clone the lab. If this works, you are good to go! You will receive your CS107e Raspberry Pi kit when you arrive at lab. Take a moment to identify all your parts and compare to the kit inventory to ensure your kit is complete. Next you will wire up a simple circuit on your breadboard to light an LED. Be sure you understand how breadboards work before you begin. Here is a short explanation of how to use a breadboard that may be a useful review. What holes are connected to what holes? How are the power and ground rails connected? Note that an LED is directional. The longer lead is the anode and the shorter lead is the cathode. The voltage from anode to the cathode should be positive. If the polarity of voltages are switched, the LED will not light up. A LED also needs a 1K current limiting resistor otherwise it can literally blow up in a fiery, smoky extravaganza! In the photo below of our circuit, we connected the cathode of the LED to the 1K resistor and then connected the other end of the resistor to the blue ground rail. Note how the LED crosses over the middle of the breadboard. To light up the LED, we need to apply power to the anode and complete the circuit by connecting the cathode to GND. To check that the LED is working, you need to power the circuit. We will draw power from your laptop using a USB to Serial Adapter (hereafter referred to as just “USB-serial”). This is the small black breakout board with a USB-A connector on one side and a 6-pin header on the other side. The USB connector is inserted into a USB-A port on your laptop. If your laptop does not have a USB-A port, you will need an adapter. When wiring, electronics gurus use colored wires to indicate what type of signal is being carried by that wire. This makes debugging tangled wires much easier. Generally, we will use the following conventions. In this next step, we choose red and black jumpers because we are routing power and ground. To provide power to your breadboard, do the following steps in precisely this order. Pick out two female-male jumper cables, one red and one black. Connect the female ends of the jumpers to the header pins on the USB-serial breakout board. Connect the black jumper to the header labeled GND and the red jumper to the header labeled 5V. Connect the male ends of the jumpers to the breadboard. Plug the male end of the black jumper into the blue ground rail. Plug the male end of the red jumper to the LED anode (longer leg). Remember to include the 1k resistor in the circuit between the LED cathode (shorter leg) and GND. Plug the USB connector of the USB-serial into your laptop. A small led on the breakout board lights up to indicate that it has power. The LED on the breadboard connected to the red jumper should also be lit. Danger: Don’t have the USB-serial plugged in to your computer while you are fiddling with the wiring. The breakout board provides power which means all the wires are live. This can cause a short circuit, which could fry your Pi. While the LED is lit, make the following measurements with the multimeter. Measure and record the voltage across the resistor. Measure and record the voltage across the LED. Calculate the current flowing through the LED. You should now be able to answer the first check in question. Identify the 40-pin GPIO header on the Raspberry Pi A+ board and orient it to match the pinout diagram (image shown below or use the postcard from your kit or poster on lab wall). The labels in the diagram identify a pin’s purpose, such as GND, power, or its GPIO number. Inspect the diagram and identify two pins labeled as 5V power and two pins labeled GND; you’ll use these pins in this step. Unplug the USB-serial from your laptop so that no power is flowing. Disconnect the jumpers between the USB-serial and breadboard. Connect power and ground from the USB-serial to the Raspberry Pi using two female-female jumpers. 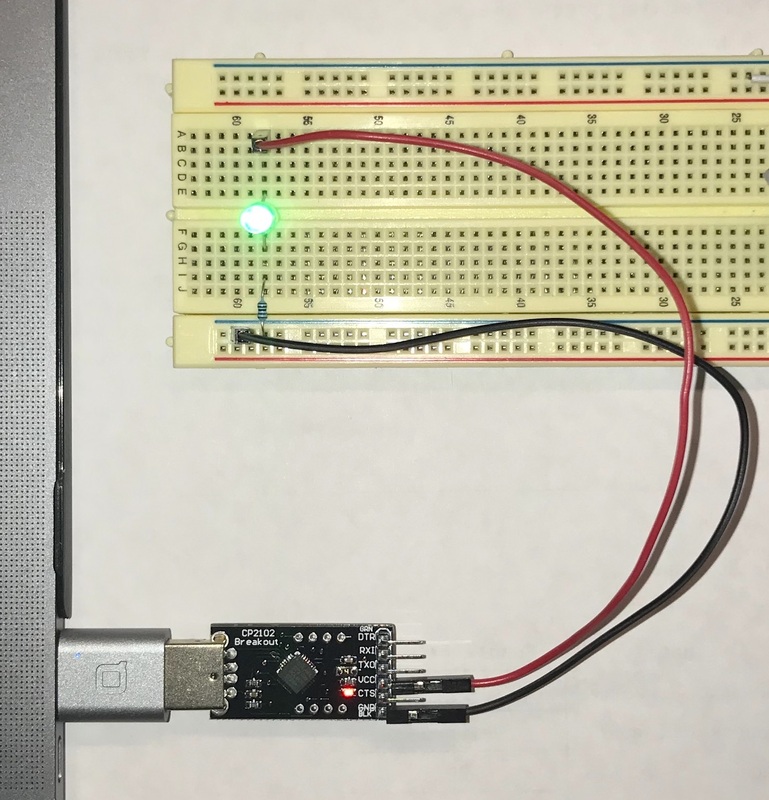 Use a black jumper to connect the GND of the USB-serial to a GND GPIO on the Pi. Similarly connect a red jumper for the 5V power. Connect power and ground from the Raspberry Pi to the breadboard using the two female-male jumpers. The black jumper connects a GND GPIO to the blue ground rail on the breadboard. The red jumper connects a 5V GPIO to the LED anode. Power is now flowing from the USB-serial to the Raspberry Pi and then to the breadboard. the LED on the breadboard. Your circuit is complete! Replace your 1K resistor with a 10K resistor. How does the brightness of the LED change? (You might want to coordinate with another group so you can compare them side by side.) Why does it change? Your Raspberry Pi kit contains a microSDHC card (shown in the photo below left). This microSDHC card is inserted in the card holder on the bottom of the Pi (shown in the photo below right). The contents of the card determine what program the Pi runs. Many laptops contain a SD card slot. To copy software to the microSDHC card, you need to mount it on your laptop. To do this, insert the microSDHC card into the SD card holder, and then insert the holder into your laptop’s SD card slot. When you insert the SD card it should mount automatically. You should see it show up in your file explorer. By default, the SD card volume is named NO NAME. You can change the name if you wish. Note: If your laptop doesn’t have an SD card slot or the card slot isn’t cooperating, ask your partner to use their computer or borrow a USB card reader from us. Configuring your SD card is a one-time task. You will not need to modify it again and in future will use the bootloader from in Part 7, so do whatever is most expedient to get your SD setup so you can move on. Now, we’ll obtain the Raspberry Pi firmware from the courseware repository. Right now, your current directory might be the blink folder. Change your shell’s current directory to the firmware folder. There should be 4 files in the firmware folder. bootcode.bin is the code that boots the GPU, and start.elf is the GPU startup code. The two additional files blink-actled.bin and bootloader.bin are programs. The SD card will need an additional file named kernel.img. Normally, kernel.img is the operating system kernel you want to run on the Pi, like Linux or Windows. But notice that we don’t give you a kernel.img! In this course, we will write our own program to take the place of the kernel, and put our program under the name kernel.img. We choose to first run the blink-actled.bin. This program blinks the Pi’s activity LED. The green activity LED on the Raspberry Pi board next to the red power LED. On the SD card, make a copy of blink-actled.bin named kernel.img. Note that only the first 3 files are required. blink-actled.bin and bootloader.bin are ignored by the Pi. Eject the SD card. If the Terminal prevents you from ejecting, type in cd .. to move to the parent folder and try ejecting again. Insert the microSDHC card into the slot on the bottom side of the Raspberry Pi board. Keep this procedure in the back of your mind. If you ever think your Pi is not working because of a hardware problem, repeat these steps. If the ACT LED doesn’t blink after booting, then something is wrong and you may need to replace the Pi with a working one. Next, we are going to use the blink program (which pulses GPIO 20) in place of blink-actled (which pulses the on-board ACT LED at GPIO 47). Start by re-wiring your circuit. Use the Pi pinout diagram to identify GPIO 20 and connect it to the anode of the LED on the breadboard. Next, update the files on your SD card. Remove the microSDHC from your Pi, and mount it again on your laptop. Take care! To eject the microSDHC from the Pi’s card slot, gently push the card in and allow it to spring back out. If you try to pull out the card by force, you can break the mechanism and potentially destroy your Pi. Delete the kernel.img file from the SD card. Copy your blink.bin file (the one you assembled in step 1 of this lab) to your SD card and rename it kernel.img. Eject the SD card and insert it into the Raspberry Pi. When you boot your Pi, the blink program should now run and blink the LED on your breadboard. Each time you change your code, you could repeat this process. This would involve powering down your Pi, ejecting the SD card, inserting the SD card into your laptop, copying the new version of your code to kernel.img, unmounting and ejecting the SD card from your laptop, inserting it into the Pi, and then powering it up. This quickly becomes tedious. Even worse, the SD connectors are only designed to withstand around 1000 insertions and deletions, after which they start to fail. Instead, we will use a bootloader. The bootloader is a program that runs on the Pi and listens on the serial port for commands and data coming from a connected computer. On your laptop, you run a script to send your compiled program over the serial port to the waiting bootloader. The bootloader receives the program and writes it to the memory of the Pi, a process called “loading” the program. After the program is loaded, the bootloader jumps to the start address of the program, and the program begins to run. To stop that program and start another, you will reset the Pi and use the bootloader again. This is much more convenient way to run your newly compiled program than all that shuffling of SD cards. You will learn to love the bootloader! Mount the SD card and make a copy of bootloader.bin on the SD card. Name it kernel.img, replacing the program you had there before. Eject the SD card and insert it into the Raspberry Pi. The next (and every subsequent) time that you reset the Pi with that micro-SD card installed, the bootloader will run. To use the bootloader, you must set up the communication channel between your computer and the Pi. The USB-serial that you are using to power your Pi also contains pins that can be used as a serial communication line. The 6-pin header at the end of the USB-serial breakout board has two pins labeled for transmitting (TX) and receiving (RX). The Pi also has a TX and RX pin (GPIO pins 14 and 15, respectively). Use the Raspberry Pi pinout diagram to find these pins on the GPIO header. Pick out two more female-female jumpers, one blue and one green. Use the blue jumper to connect the TX on the USB-serial to the RX on the Pi, and the green jumper to connect RX on the USB-serial to the TX on the Pi. As always, first unplug the USB-serial from your computer before fiddling with your wiring. Note: The connections run from one device’s TX to the other’s RX, and vice versa. Do not connect TX to TX and RX to RX! The proper connections are shown below. Note that your USB-serial may have pins in different positions. Confirm that your connections match the labels on your USB-serial. Don’t just follow the picture blindly! In the above photo, the green wire connects the RX header pin on the USB-serial to the Pi’s TX pin (GPIO 14). The blue wire connects the TX header pin on the USB-serial to the Pi’s RX pin (GPIO 15). Plug in your USB-serial to reset your Pi. The bootloader should run on reset. When the bootloader is running, it signals that it is waiting to receive a program by repeatedly giving two short flashes of the ACT LED (the green LED on the Pi board). This “da-dum” is the heartbeat that tells you the bootloader is ready and listening. Look at your Pi now and observe this rhythm. Breathe in sequence with it for a moment to celebrate having achieved bootloader enlightenment. This script sends a binary file to the Raspberry Pi bootloader. Version 1.0. Note: Verify that rpi-install.py is Version 1.0, if not, that means you are not running the correct version! Please ask a staff member to help resolve. Note: If you are on a Mac, make sure you installed the CP2102 and serial drivers as described in the Mac install instructions. On Windows or Linux, you don’t need to do anything special here. Let’s try bootloading a program. On your computer, change back to the lab1/code/blink/ directory where you assembled blink.bin in step 1. Sending `blink.bin` (72 bytes): . The ACT LED turns on steady on while loading the program, then goes off. At this point, the blink program takes over the Pi and will now blink the LED on your breadboard. If you change your program and wish to reload it onto the Pi, you must power cycle the Pi. Why can’t you just run rpi-install.py again after the bootloader has already loaded a program? One way to power cycle the Pi is to unplug the USB-serial from the USB port on your laptop, and then plug it in again. The Pi will reset into the bootloader, ready to receive the new version of the program. Retype the above rpi-install.py command, and the new version will be sent to the Pi and run. If there is anything you don’t understand about this program, ask questions of your partner and others. Look at the bytes in the blink.bin you assembled earlier by running xxd -g 1 blink.bin at a shell in the blink folder. Find the first occurrence of e3. What is the byte offset of e3 relative to the start of the file? Change the program such that the blink rate slows down by a factor of 2. Note that changing the program is a multi-step process. First you edit blink.s in a text editor, then go through the commands in step 1 again to build blink.bin from it, and then finally unplug and replug the Pi and run rpi-install.py again to run your new blink.bin. Make sure you understand why these steps are all necessary. Now perform experiments to determine how many instructions per second the Raspberry Pi executes. This last part is optional. You do not need to use buttons for Assignment 1, but you will for Assignment 2. There are no check-in questions for this exercise. Measure the resistance across the pushbutton legs using a multimeter and figure out which pins are always connected and which become connected when the button is pushed. Use your observations to determine how to position the button correctly on the breadboard. The pushbutton needs a 10K pull-up resistor to the red power rail. Verify that the resistor is 10K Ohms using the multimeter. Measure the voltage at the pin, and measure it again when you push the button. Here is a program that reads a button and turns on or off the LED depending on whether the button is pressed. To run this program, connect the button to GPIO 10. Make sure the jumper is connected to the correct pin on the Raspberry Pi. Also, make sure the pull-up resistor is properly installed on the breadboard. Challenge yourself to understand what each line of code accomplishes and why it works as expected. Feel free to add your own code annotations if that helps. Here are a few questions to test your knowledge. To answer these questions you will have to read the Broadcom peripheral manual, or ask someone who knows the answer. What does the peripheral register with the address 0x20200034 return? Why does the input value go to 0 (LOW) when the button is pressed? How does the Pi know which branch to jump to when it reaches beq on? Before leaving lab, go over your check-in questions with a TA. The TA will verify your understanding and can answer any unresolved questions you have. Note, again, that the goal of the lab is not to answer exactly and only these questions – it’s to work through the material. The questions are an opportunity to self-test your understanding and confirm with us. It’s okay if you don’t completely finish all of the exercises during lab; your sincere participation for the full lab period is sufficient for credit. However, if you don’t finish, we highly encourage you to work those parts to solidify your knowledge of this material before moving on. In particular, having successfully completed this lab is a necessary step before tackling this week’s assignment.